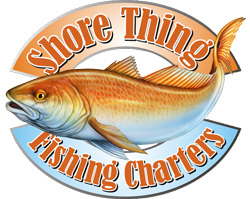 Thursday we technically did not have "fishing" charters, but we still had two boats out. While I was at one heck of an Easter egg hunt for my daughters pre-school class, captains Kyle, Kenny and Matt were enjoying a gorgeous day on the water. Capt Matt had a marine construction company on his boat. They needed to some eyes on some possible work in around the marsh. The head boss is a fisherman and told the crew if they got done early, then they could fish. Needless to say, they left early, got their work done and got to fish. Capt Matt said the water was decent down in the south eastern section of the marsh. Water was chilly, but still little to no bait. They did grab a few trout and reds before having to get home. I know them boys were happy to happy to wet a line after getting their chores done. Capt Kyle and Kenny have been on a steady diet of deer and hog from a successful hunting season. They were looking to get some fresh fish for a change on the menu. They checked a few of their trout and red areas that are still not quite ready. They were not coming home without supper, so they hit a few go to spots in chilly water. 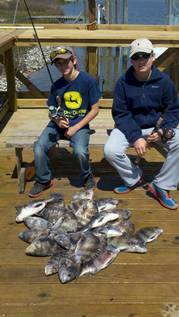 The boys found there meat fish, and grabbed many sheepshead for the cause. They said it was every single drop on any thing that barnacles were growing on. They even got lucky on a few ground mullet, before calling it a day. Friday we had all five boats out, 1 on a half day near shore, and the rest went to the marsh. 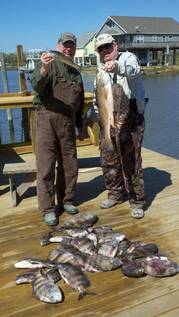 Capt Matt had Shore Thing Platinum Plus member Don Smith and his buddy for a day in the marsh. I know Matt did not fish the east side, cause that is where I was. Pretty sure he was over in the 3 mile area. Sounded like he did the best of all of us on the red fish. He picked away at them, but got 7 slot fish, some sheepshead, and a few keeper trout for garnish. He has been chunking the Matrix Shad baits rigged on the popping corks, tight lined and even on the spinner baits(like the rest of us). 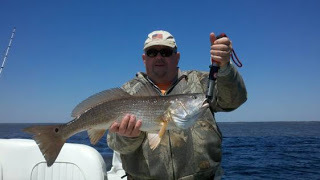 Capt Kenny was on the half day near shore trip with the Bailey boys form Pearl, MS. They did great, staying close to home, in the nice weather. 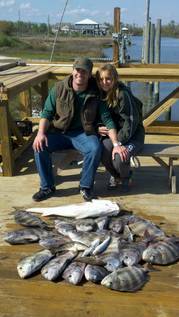 Fishing the reefs and bridges, Team Bailey grabbed 23 sheepshead and some puppy drum to boot. Kenny was done early but came back to the dock to lend a hand at the cleaning tables. The two boat trip that Capt Kyle and Capt Jimmy Ray took out would need that help. Our good friend Capt Pappy "Old Pro" sent this trip to us, many thanks Old Pro. The Cathy Collins crew from New Orleans left the dock 30 minutes before my crew. When I got with in radio range, they were already talking about full fish boxes. They landed on a nest of big sheepshead and their crew started herding sheep(into the fish box). Anything that had shrimp on a hook, got bit every cast. 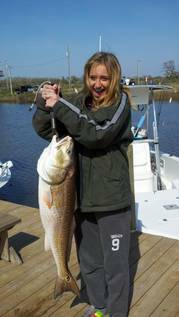 Capt Jimmy Ray had a young lady from England on his boat, and she got the big fish honors with a big bull red. They spent the rest of the day fishing oyster bottoms for specks, whites and ground mullet for a little lagniappe. 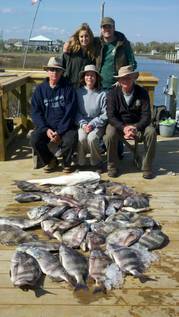 The Collins crew finished their day with close to 50 rather large sheepshead, a red, and mix of the others. Capt Kennys serrated knife and help was much appreciated at the cleaning tables. Someone was asking Kenny a the dock if sheepshead was good eating. I think the wise Capt Kenny put it best when he said, "the only reason people don't go after sheepshead like redfish is because some fancy chef on TV has not told them too. No one ate redfish back in the day till chef whats his name, started a blackened redfish craze". I had Shore Thing Preferred Member Blaise Ernst, his son Christian and their friends Daniel and Adam for a dual father and son spring break trip to the marsh. Blaise wanted to do two things, go to the marsh, and get the youngsters on bent poles. Following Captains Kyles and Jimmy Rays lead, I set up shop on a flock of sheepshead. First cast, last cast and everyone one in between got bit. The fish were chasing baits to the boat, even hitting plastics. All the sheepshead were big and the young anglers got a work out. When the fish box had a nice layer of sheepshead, we went looking for trout and reds. Found some of the prettiest water I have seen this year. Still not much in the way of bait, the warmest water we found was 60 degrees. Did grab a very few trout on the Matrix Shad under the popping corks. Speaking of popping corks, been trying out a new one from Boat Monkey Corks. It is the loudest contraption I have ever heard. They use a washer in between the weights and beads that makes the loudest pop you could imagine. I know Gus's Net and Tackle in Slidell caries them, but they said they should start selling them over this way soon.